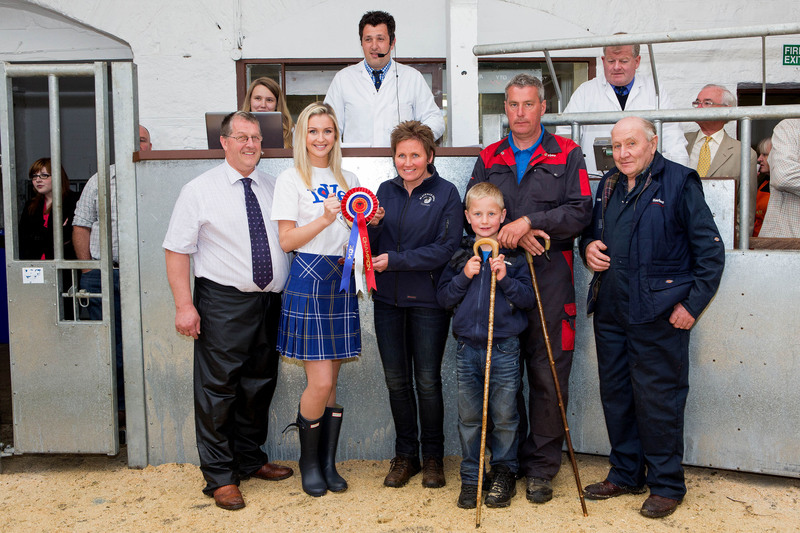 Miss Scotland, Ellie McKeating, entered into the ringside spirit at Dalmally Mart on Saturday (September 13th) when she joined in the bidding at the United Auctions’ sale. Miss McKeating who is getting to know Scotland’s livestock sector better in her role as ambassador for Scotch Lamb with Quality Meat Scotland (QMS), created quite a stir at United Auctions’ biggest Annual Show and Sale of Blackface Lambs in recent years. Clearly enjoying the buzzing atmosphere of a packed ringside at the sale, which had an entry of some 8000 lambs and feeding sheep, Miss Scotland successfully bid (on behalf on an undisclosed buyer) for a cheviot cross lamb from seller Stuart Galbraith of Barachander Farm, near Loch Awe. The visit to one of Scotland’s leading livestock auctioneers’ facility was part of Miss McKeating’s induction to the market system. 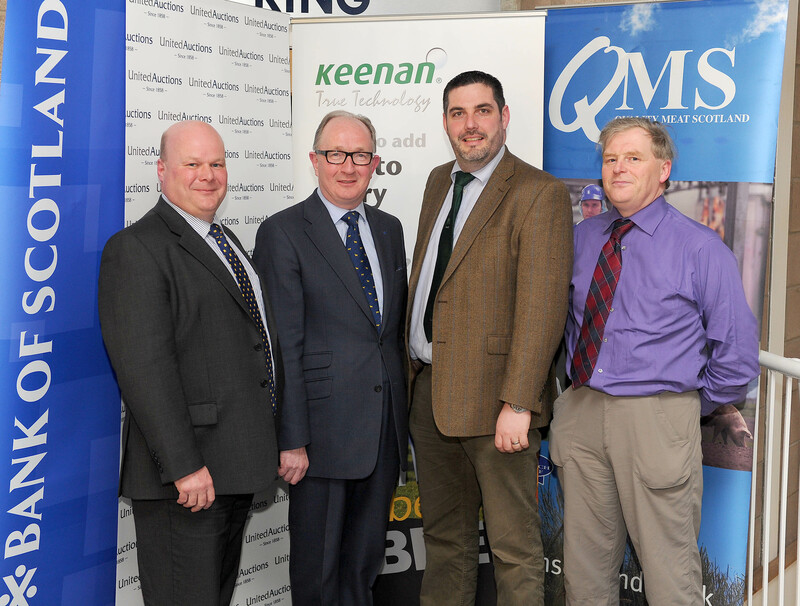 It follows a number of engagements in recent weeks, including joining farmers across Scotland at sampling events during the recent “Love Scotch Lamb Weekend”, organised by QMS, NFU Scotland and the National Sheep Association. And as she toured the bustling Dalmally market, Miss McKeating spoke with UA customers from Crieff, Crianlarich and Oban about their stock and was stopped for selfies by a trio of younger Oban farmers below (l-r Callum Leith, Blair Menzies and Ross Ferguson) who were selling at the bumper event. She went on to present the James Weir Memorial Trophy for the championship pen of Blackface Lambs to three generations of the Buchanan family of Achnaba Farm, Oban, including Archie Buchanan, his daughter Morag MacCorquodale, husband Donald and their son Donnie. The Buchanans also achieved the top price of £62.50 for their championship pen bought by Judge Bill Cameron from Keith in Aberdeen. Miss Scotland also enjoyed a Scotch Lamb burger, courtesy of the marts’ café, at the end of her visit. Pic caption (Miss Scotland Dalmally 7):Miss Scotland channels her inner Bo Peep at Dalmally. United Auctions (UA) are Scotland’s leading livestock auctioneers and procurement specialists and operate a network of different auction markets across Scotland, including Stirling, Huntly, Lairg, Dalmally, Tiree, Islay, South Uist and an area office and lairage facility at Oban. The company conducts auctions of both commercial and pedigree livestock, including the world-famous Stirling Bull Sales, and provides farm-to-farm and farm-to-abattoir procurement services. In 2013, UA was named in the London Stock Exchange’s ‘1000 Companies to Inspire Britain’. Miss Scotland, Ellie McKeating, is set to visit her first ever livestock sale when she attends Dalmally Mart next week. United Auctions will welcome Miss McKeating to their Annual Show and Sale of around 6000 Cross Bred and Blackface Wedder Lambs and Feeding Sheep on Saturday, September 13th, 2014. The visit to one of Scotland’s leading livestock auctioneers’ important facility in the west, will form part of Miss McKeating’s induction to the industry in her role as a “Lambassador”, supporting Quality Meat Scotland’s ongoing promotion activities behind Scotch Lamb. Miss McKeating has been meeting with farmers to learn more about the industry and the stockmanship skills involved in sheep farming and also took part in Scotch Lamb sampling events around the country during Love Scotch Lamb Weekend (August 23rd and 24th). During her visit, Miss McKeating will experience the market system first-hand at the ringside, meet farmers from Argyll and the islands and view the quality livestock on offer before presenting the James Weir Memorial Trophy for the best pen of Blackface lambs. Picture caption: Ellie McKeating, Miss Scotland, in a Scotch Lamb branded dress. The James Weir Memorial Trophy was introduced in 2010 to honour the late leading livestock auctioneer. Donated by Mrs Weir in memory of her husband, it is an annual prize at the sale to mark Jimmy’s involvement and passion for the area and the mart.